They’ve impacted your life, even though you may not know them. Don Cummins was instrumental in the initial planning and development of MoPac from 1st Street to Highway 183 back in the late 1960s. He had his eye on Austin’s future then, and he still does. 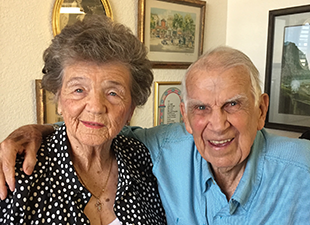 The promise of what’s to come — a new future of care in Central Texas and economic growth — compelled Don and Betty to make a generous donation to help build Dell Seton Medical Center at UT. Don, a founder of the real estate firm Bradfield-Cummins, Inc., learned the business from his father-in-law Landon Bradfield. Betty has lived in Austin her entire life, and she and Don graduated from The University of Texas at Austin. Don and Betty have a long-standing connection to Seton. Both of their sons were born at Seton Medical Center Austin. When Don suffered kidney failure recently, he credited Seton for his recovery. He now receives dialysis three times a week. “Betty and I wanted our donation to Seton’s new teaching hospital to help the many others who suffer from kidney disease and are on dialysis.” Don and Betty’s generosity will be recognized on the dialysis treatment room in the hospital. “I like the Bible verse ‘everyone to whom much was given, of him much will be required,’ and Don and I both believe that,” says Betty. Addendum: Don and Betty have both passed away, but their legacy lives on through their generous gift to the Dialysis Unit at Dell Seton. Don lived to see the plaque in the unit honoring their contribution.